Hey, mamas! You’re going to be so glad you logged on today because you have seriously just hit the mother lode of all giveaways. Today is our first “Gold Mine Giveaway,” sponsored by Underwood’s Fine Jewelers. Yes, that’s right. I said Underwood’s – the mecca of all jewelry stores. 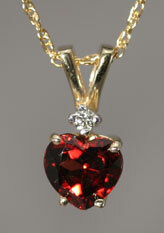 We’re giving away a gorgeous heart-shaped garnet pendant topped by a diamond. See the photo? It’s beautiful. And it can be hanging around your lovely neck if you enter the drawing and win. Here’s how you do it: You click on a link which will open a window showing a page from the Underwood’s Online Jewelry Gallery. You’ll see five rings in this window. Simply look at those five rings and decide which one is your favorite style. (Click on each ring photo to see a larger image of it, and hit the “close” button at the bottom right of each photo when you’re finished.) You then close out of the Underwood’s window and come back to our site where you send us an e-mail with a vote for your favorite ring. When we receive your e-mail, we’ll put your name in the hat for our Gold Mine Giveaway drawing. The garnet has already been on the site for a day, so you only have about 13 hours left to enter the drawing. Then we’ll draw a name out of the hat and send an e-mail to the winner letting her know she is the luckiest mama in Northwest Arkansas. See how easy it is? All you have to do is browse through five beautiful rings, vote for a favorite, send an e-mail, and that’s it. You’re entered to win. We won’t ask you for any personal info, and we never sell info to those irritating spammers. No worries, mamas. So now you know the rules. Ready to look at rings and vote? Okay, click on this link: VIEW RINGS HERE. Don’t forget to come back to this spot to cast your vote with an e-mail. Sometimes different computer browsers won’t play nice and let you click the e-mail links. If that happens, just send us an e-mail the usual way and put this address in the “To” line: mamas@nwamotherlode.com. If you’d be so kind as to send an e-mail to a few friends letting them know about our site, we’ll enter your name in the drawing again to increase your odds of winning. Just be sure to put mamas@nwamotherlode.com in the CC line of your e-mail, so we’ll know to put your name into the hat again for every friend you tell. Gold Mine Giveaway: Win an Underwood’s Garnet Necklace! 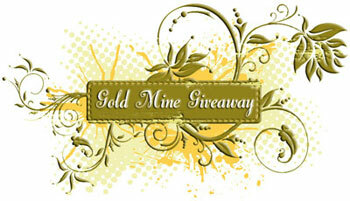 Just a few hours left in the Gold Mine Giveaway! Underwood’s diamonds are this girl’s new best friend! 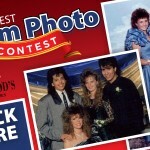 Funniest Prom Photo Contest sponsored by Underwood’s Fine Jewelers! Announcing the De-LUXE Mother’s Day Getaway Giveaway Winner!